The « Bambou » apartment, is the right balance between space and privacy. This is the ideal place to spend a holiday as a couple, for example for a memorable honeymoon in a dream setting. Barely through the door, you’ll want you stretch on the sofa for a little relaxation. 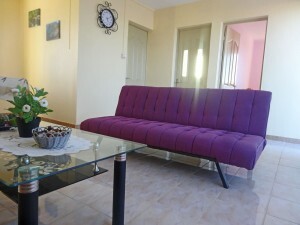 Sitting or lying comfortably, you will speak quietly or will enjoy your time in front of the flat-screen TV (cable TV). It is also the ideal place to connect to the internet (free WiFi). After these sweet moments, nothing better than to cook a small dish. The owner thinks of everything and gives you much more than the essential provision: the stove to the fridge through the microwave or coffee maker is a well-equiped kitchen that is available to you. 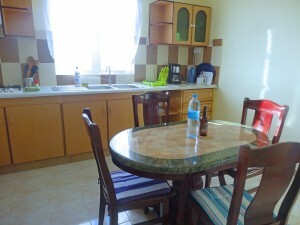 It only needs to lay the table (of course included) and come to the table: Dining room table and chairs for 4 people, pleasantly arranged for your meals. 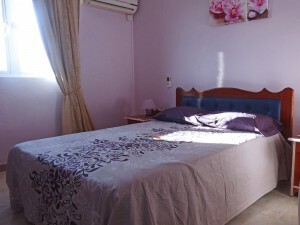 The “Bambou” apartment, it is also a room with pleasant size and tastefully decorated. With king size bed you will spend restful nights. And for even more comfort, you will set the air conditioner to the desired temperature. Linen is also provided. The bathroom obviously respects the major features of the apartment: space and comfort, so that your shower is a real moment of well-being. You now know much more on the “Bambou” apartment.